One replacement chamber for all Respironics "Legacy" REMstar and H2 Heated Humidifiers. Includes two replacement couplers to attach the chamber to the machine. These are for the older original REMstar machines, hence the "Legacy" designation that look like the machine pictured here. They will not fit the newer Sleepeasy, M-Series, or PR System One machines. ** NOTE - This is the new design chamber with anti-backflow valve to prevent water from backing up into your machine. My old, but still operating, REMstar CPAP machine had a humidifier tank whose rubber-coated base had developed holes -- The underlying aluminum plate was badly corroded, and could not be adequately cleaned. I did not think I'd be able to find a replacement stand-alone tank. 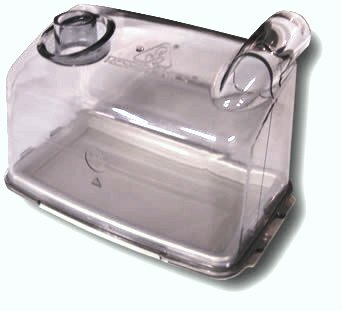 It looked like I'd have to buy the entire CPAP base with heating aparatus, just to get the tank, and it would have cost me well over $100. I was pleasantly surprised to find the tank at BestCPAPprice.com, for less than $20. It's design has changed just a bit over the years, so it's not identical to the old tank, but it fits onto the heater-base and functions perfectly. THANK YOU!! The plastic portion of this product is excellent, but the metal plate deteriorates to the point of being unusable within a few months. This chamber fits perfectly and holds H2O as advertised. Better Design than the original humidifier that came with the CPAP machine. Also has a better connection to the CPAP machine. The new water chamber works great. No problems. Liked the quick delivery. Exactly what I ordered and came in a timely manner! Wish I found this site YEARS AGO! Item was EXACTLY as described and at the BEST PRICE I HAVE EVER FOUND!!! Works like a charm and saved me from buying a whole new unit! What a difference....why did I wait! My cpap machine has 21,000 hours...never replaced the humidifier tank....it cracked...never thought I'd find another....these guys had the perfect replacement, and did I mention...the BEST prices....and it arrived in no time.....what more could I expect! Thank You! Great Price and Nice Product! This is the first time I've tried the new model with the anti-backflow valve. It works great with the exception of interfering with the automatic start up on my machine. Sometimes it works and sometimes it doesn't. I've gotten into the habit of just pushing the start button when I put on my mask. Not a big deal. Your products are priced very reasonably.d I purchase them so as to NOT rip-off my insurance company or Medicare. Each of which I am eligible. The service is very good and receipt of the product is very quick after making the order, Thank you for making these purchases possible for me. This replaced the original perfectly. It has some design differences that made me wonder if it was the right one, but again, it's perfect. I can't get over the speed and efficiency when ordering supplies. I recently ordered the wrong part but still had the correct replacement within 3 days. And they paid for return shipping. Great customer service. I'm hooked. The order came just as I wanted and very quick. Great job!! Everything was fine. Order, delivery, and merchandise! Q: Will part #1035162 fit the REMstar model No, 1005792? Q: When will these be in stock? A: Unfortunately, these chambers are on back-order from Respironics until April 2017. You can put yourself on the waiting list for them, and when they are back in stock, we will notify you by email.